Marty Barry was a high school scoring star in Troy, New York. After graduation, Barry entered Rensselaer Polytechnic Institute in Albany to study law. While still in college, Barry embarked on a career in professional basketball. He attained immediate success. 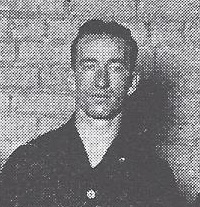 In his rookie season (1919-20) he finished third in scoring in the New York State Basketball League and led Troy to a first place finish in the second half of a split season. Barry followed up his outstanding first-year with two more top-five finishes in NYSL scoring the next two seasons. In the fall of 1922, Barry signed with the Rochester Centrals, a powerful barnstorming team. He remained with the team for the next ten seasons. In 1925, the Centrals joined the American Basketball League, where Barry quickly established himself among the league’s top offensive stars. As the decade ended, age and the growing demands of his law practice limited Barry’s role with the team.